Alderson, DePodesta, and Ricciardi will try to match this triumverate's success. Today is the 25th anniversary of Game 7 of the 1986 World Series. It was a game the Mets would win to cement their second (and last) World Series title. The roster of the 1986 team was the result of shrewd draft choices, key trades, and a top minor league system that helped the Mets rebuild from the abysmal 70s teams, to a perennial contender from 1984-1990. There are some similarities between the organization in the early 80s and today’s Mets franchise. A new General Manager has taken over a mediocre club, with a thin farm system and sparse financial breathing room. 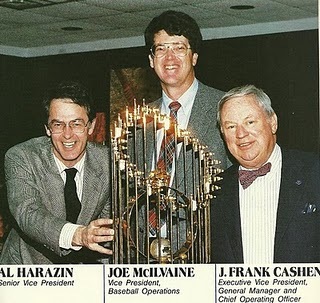 Sandy Alderson may not have inherited a team as awful as the one Frank Cashen took over, but it always feels like the 21st-Century Mets are teetering on the edge of a 100-loss season. Alderson will have to build his Mets similar to how Cashen built the eventual ’86 champions. The Mets of the 80s used their draft picks and other minor league prospects as both key members of the big league club, and as chips for trades. They built their farm system to the point where they could part ways with some prospects (i.e. Hubie Brooks, Calvin Schiraldi, Rick Ownbey) to fill voids on the major league team, because they knew they still had depth in the organization. That’s the approach Alderson and the 2011-2012 Mets have to emulate. The farm system is thin on prospects beyond AA (where Harvey, Familia, Wheeler, Mejia, et al, provide hope). They must develop enough depth to build a solid major league club, while still having the ability to trade prospects for needs that the farm system can’t fill. Granted, there are young players ready to contribute now. Lucas Duda, Ike Davis, Ruben Tejada, and others. That’s why, in some ways, this team is reminiscent of an early-80s Mets team. Let’s say 1982. Future members of the ’86 Mets were already on their way up through the minors: Gooden, Strawberry, Dykstra. Some were already beginning to make major league contributions: Wilson, Backman, Orosco. Two years later, the Mets finished second to the Cubs in the East. It’s conceivable the Mets could start making noise two years from now, when some of their existing prospects reach the majors, and youngsters on the current major league roster gain experience. But they have to build the team the right way, like Cashen did in the 80s. Don’t look for the quick fix – build the organization from the bottom up. This is the best way to sustain a contending ballclub for many years. For the record, the happiest guy in this picture is also the least baseball-savvy. In fact – he’s a moron. Not a bad idea, Al ——- but lefties don’t traditionally catch. All I remember him for is trading David Cone. . . .
And assembling The Worst Team Money Could Buy. Essentially, a friend of The Wilpons they put in charge. Let’s see less of that, and more of what MLB mandated……the hirings of Alderson, Ricciardi, and DePodesta. I agree, I was never a huge fan of Harazin. George Foster was a trade, too. The Mets sent Alex Trevino and a couple of other guys to the Reds for him. Getting back to 1982 – From the beginning of the year until May 31st, the Mets were 27-21. The rest of the season they went 38-76 (.333), which has got to be one of the worst extended stretches since the debut season of 1962. Excellent post. Comparing this team to ’82 makes a lot of sense. Unfortunately: It also means that 2012 is going to be long one….maybe even 2013. Sigh. It can be hard to take the long view sometimes. As a long time fan I’m willing to wait but I hope New York can be patient too. I always love hearing about the 86 Mets Storybook ending. When does the article about Generation K come out or when we had the outfield of the future with Millidge Gomez and Martinez? I just feel bad for any Met fan waiting around two more miserable years for our prospects to grow up and win, Highly doubtfull. And this front office will never go get the Carters, Darlings, Hernandez, ect ect it needs to win. This team is going to let Reyes walk and sign David Wright for 17 million a year, Wright = Bonillia. The Diamondbacks got rid of Mark Ryenolds he is just about the same player as wright and thats why they were in playoffs and we werent. Boy nothing like talking Mets to get me depressed. Are you kidding? Being a long time fan you wade through the muck and mire and the champagne is sweeter than ever. 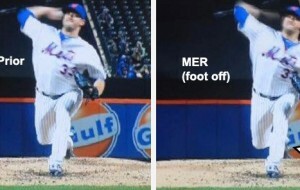 It’s the way of the world for a Met fan. I get excited watching yong players blossom and provide that potential. Duda has pop, Tejada has leather, and Davis has some of both. That is the Met fan talking. We may have a few years really in the muck but like it never happened before? How many Met rosters over time were tied to the word “hapless”. I bleed Blue and Orange and see a team on the rise with interesting players, coaches, and management. LETS GO METS! Has to be some fight in the fans too. We want Jose to stay and he should. If he doesn’t it ain’t gonna stop being a fan…no way! It just gets more interesting. Wright a Philly? That’s someone’s joke. Go Sandy and do your thing. I’ll be watchin’ , smiling, and swearing in my Mets cap. I am sorry I cant get excited about duda tejada and davis, What in two years Ruben will be half the player of Jose Ike might crack the top 10 in 1b and Duda some pop who cares he is an american league DH in the Making, Its not like he is a young Matt Holiday or something. I would rather trade the three of them for king felix and resign reyes and sign beltran to play right again. I dont want to wait anymore, I have been waiting since 1986. A few years in the muck? If team was run right the Yankees would be playing in New Jersey right now. But its not they just keep making the same mistakes year after year after year and I was a die hard season ticket holder listen to wfan every day come on these blogs ect ect ect but I AM SICK AND TIRED OF WAITING. Just like 82. What star player did we let walk away to free agency in 82?????? Nothing is the same. These new guys are making the team a “small market” club. The group then was building a winner. All these guys advertise is “he’s cheap”. Never do they mention talent.. Why? Because they don’t care about talent. Lower the payroll enough and the crooked Wilpons will make a profit even with 15,000 at a game.